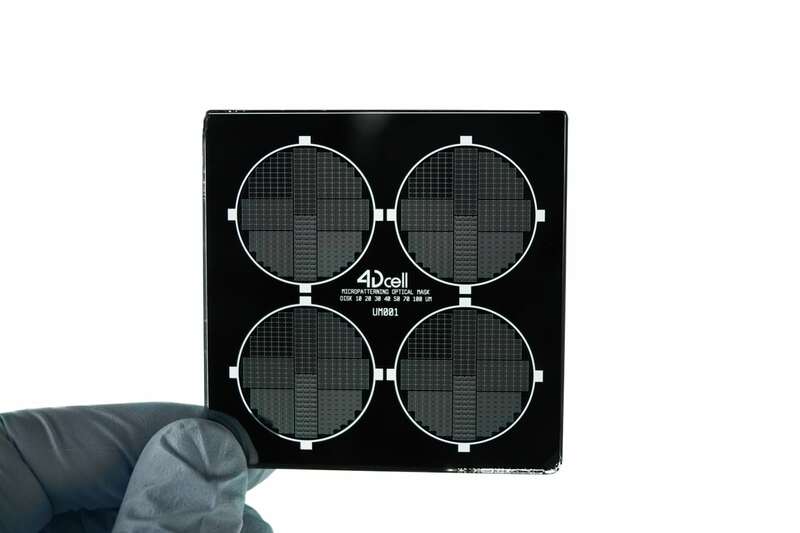 The 4Dcell photomask is a quartz mask with a chromium designed coating for the aim of the micropatterning experiment. It is used for the printing of the micropatterns on glass slides, with deep UV. The micropatterning photomask is sold in the micropatterning kit and by itself to make your own micropatterns. It is a 6 cm x 6 cm square that can be used with the Masker for the printing step of the micropatterns. The standard shapes offered by 4Dcell are the disks, lines, squares, rectangles, triangles and grids. You can also ask for a customized shape that we can design for you. The formats accepted for the design of a customized photomask are the following: DXF, GDSII, EPS or PDF.